Insta-Test 3 Test Strips Twin Pack. 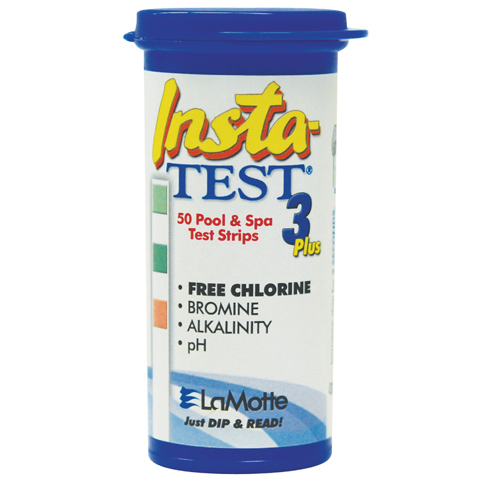 The Insta-Test 3 measures Free Chlorine 0-10 ppm (or Bromine 0-20 ppm), pH 6.2-8.4 and Total Alkalinity 0-240 ppm. Save 15% on two bottles of 50 strips each. Testing for: Chlorine, pH and Alkalinity. 3 Tests on one strip. Pool and spa owners are always looking for something quick and easy. It’s an unbeatable test system: no caps to worry about and even greater moisture protection. 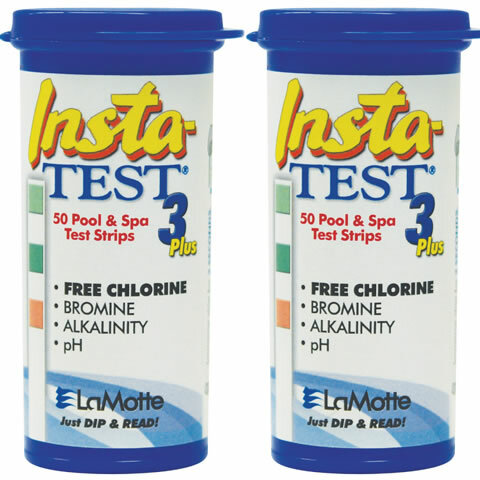 We guarantee the Insta-Test pool and spa strips will help the user maintain proper free chlorine levels and balanced water. PopTop caps are easy to open and shut – guaranteed for 1,000+ openings. The patented vial has a molded desiccant liner, protecting the strips from moisture intrusion and eliminating loose desiccant bags. Measures free chlorine or bromine on one strip.